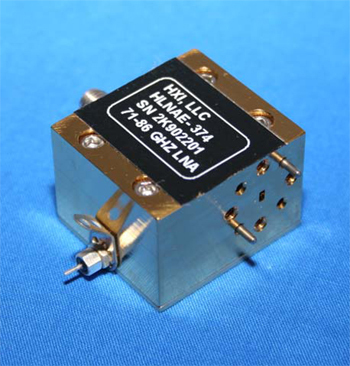 The HLNA Series of Low Noise Amplifiers covers the frequency range from 14 to 110 GHz. A wide variety of gain and bandwidth combinations are available to provide solutions for radar systems, communications systems and other applications. Variations of the amplifiers listed in the HLNA data sheet and totally new amplifier designs can also be provided, usually without an NRE charge. Most models offer single bias operation with internal regulation and bias sequencing. MMIC technology is employed in every amplifier for high reliability and repeatability.